This is an ongoing research project regarding the transformation of the scale of urban fabric in cities. Using several U.S. cities as case studies, this research charts the evolution of building footprint size over time (essentially the average size in area of buildings built in a city in a given year), to see what the trends are in building size over time. These trends, when seen at the scale of the city using figure ground maps such as the ones shown below, reveal that the increasing scale of building footprint size over time has led to a coarsening of urban fabric. This is despite decades of research in the fields of planning, design, and environmental psychology showing the benefits of fine-grained, human-scale urbanism for livability, walkability, and other dimension of urban life. 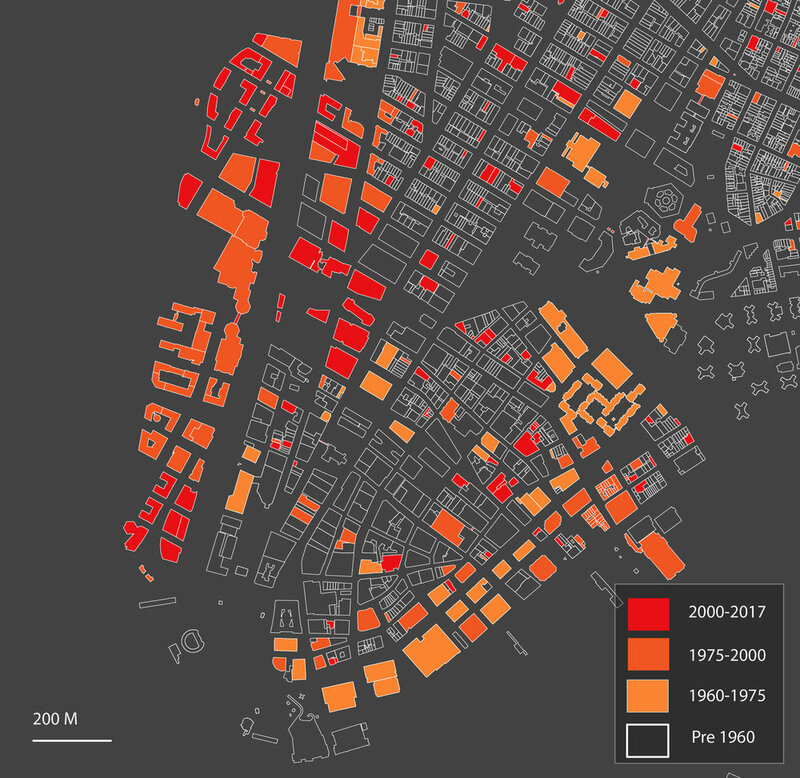 The above graph shows building footprints in Manhattan, highlighting the more recent construction (since 1960) in red, orange, and gold. Since this period, a scalar transformation in the size of buildings has led to a coarsening of city fabric. 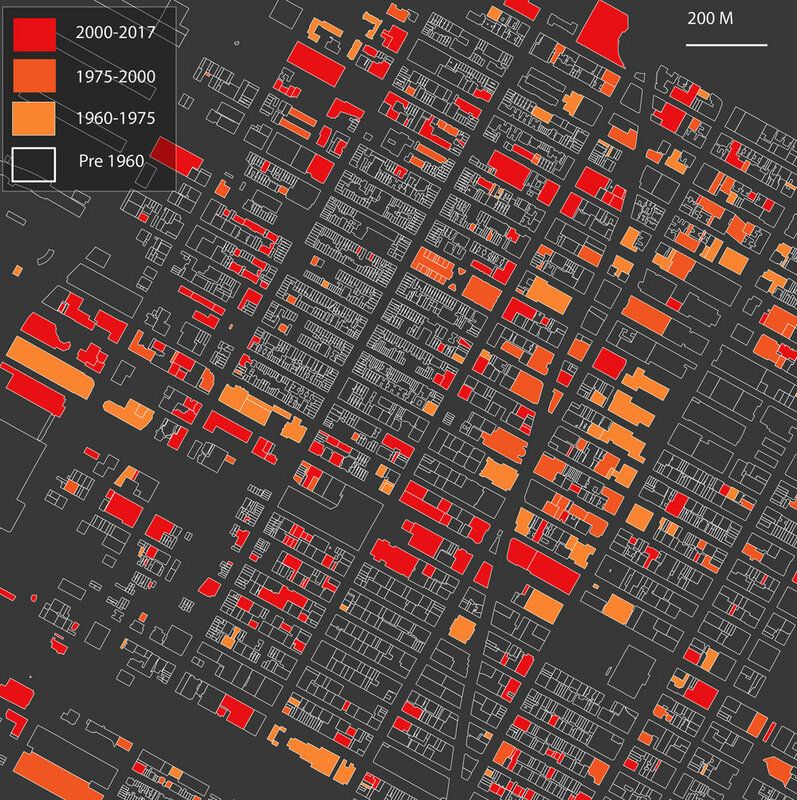 The above graph shows building footprints in Midtown Manhattan, highlighting the more recent construction (since 1960) in red, orange, and gold. Notice the larger building footprints for recent eras of construction in Times Square and along Sixth and Seventh Avenues. 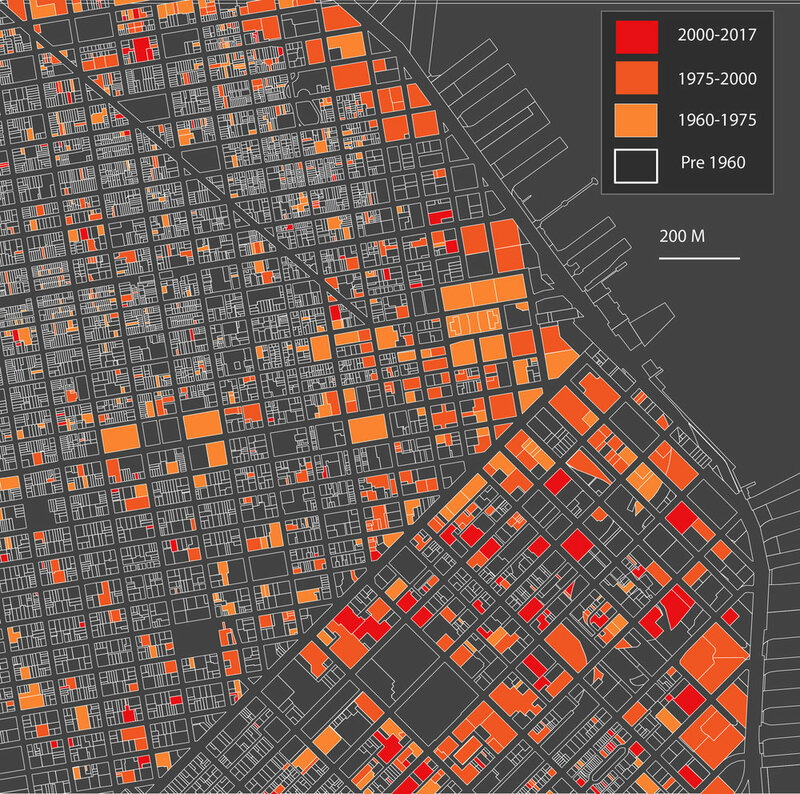 San Francisco has also seen a coarsening of urban fabric as more recent construction has tended to be at a much larger scale than older areas of the city (such as in the left side of the above map). Like New York, this has been largely driven by an increase in the size and scale of commercial real estate. However, recent demand for luxury housing is now driving an increase in the size of residential buildings.